Fine of 5s Friday 30th January 1863 for serving customers at illegal hours on the previous day. Convicted 18.10.1920 for permitting a quart bottle of rum to be taken away on a day prohibited for that purpose. Fine 20/- plus 10/6 costs or 14 days in detention. Note : In 1863, the directory by Cobb gives Benjamin Burton at the STEAM PACKET, Hall Quay. Other sources name Henry Savory at this house in 1863 and later. The 1863 directory by White gives B. Burton at the CAMBRIDGE TAVERN. Address as Fishers Quay in 1822. The EMPEROR STEAM PACKET 1836 & 1845. Amy Thompson was summoned before Yarmouth Police Court for threatening Hannah Lodge. Mr Diver appeared for complainant, and Mr Wiltshire for defendant. From complainant's evidence it appeared that she was a married woman, and was at that time living at the Steam Packet Tavern, waiting on Mr Steele's (the landlord) wife, who was ill. On Wednesday, April 25th, when she was in the bar, the defendant, who is sister to Mrs Steele, came in and commenced to abuse her. She retired into the bar parlor, but defendant followed her and again abused her and also threatened her. She ran upstairs, and defendant came to the bottom of the stairs and again threatened to do for her. She asked the defendant might be bound over to keep the peace. Defendant was bound over in two sureties of £10 each to keep the peace for three months. Advertisement in the Norwich Mercury of 10.02.1904. ``Good strong country girl wanted to do housework. Apply to Mrs Ellis, Steam Packet Hotel''. Mrs. Ellis summoned her husband Hector Friday 13th October 1905, seeking a separation on the grounds of the persistent cruelty that he had shown towards her. She stated that she could not rely upon him for more than five minutes and try as she might, she could never please him. Scrubbing doorsteps was his idea of a wife. He had never been a sober man and on one occasion he had gone to bed, drunk, at 8 am and did not get up until 4 pm when he went to the bar and tossed for quids. During the birth of her child he had promised not to touch a drop, but when she got up he admitted that he had been drunk for seven days. He had slapped her face in the presence of a servant and on 23rd August he had thrown a bowl of eggs about, smashed a glass and threw bread and butter about. He regularly had a dozen gin and milk before breakfast and then went to the barrel with a half pint glass and `tossed the spirit off neat'. In defence it was said that Mr. Ellis had served seven years in the army and his father had put £600 into the business for him. He denied ever striking his wife. After retiring for two minutes the magistrates dismissed the case through insufficient evidence. Licence removed to `Fowlers Plot ', Caister Road - Premises (to be) named the BURE HOTEL. Licence removal declared final 12.12.1939. The sites of the STEAM PACKET and the CROWN & ANCHOR were combined in the development of the YARE HOTEL, the new house opening 13th December 1939. Thanks to Maureen Rust for the EDP newspaper article. 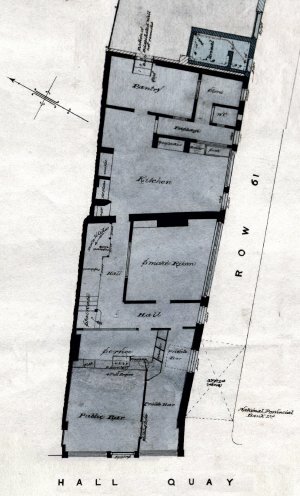 Plan produced in 1927 - revised 1937.